Brando staffers welcome the Upchurch family. Virtuoso’s Upchurch family rethinks their vacation strategy for 2017. A spa suite and (below) a villa pool. The United Nations has declared 2017 the Year of Sustainable Tourism – here’s how that inspired Virtuoso’s Upchurch family to rethink their vacation strategy. THE STATISTICS TELL IT ALL: Over 1 billion tourists last year contributed more than $7 trillion to the global economy, and tourism is forecast to grow each year for the next decade. To ensure that growth is an opportunity to alleviate poverty, conserve cultural heritage, and protect the environment, the United Nations has called upon the world to embrace sustainable travel. 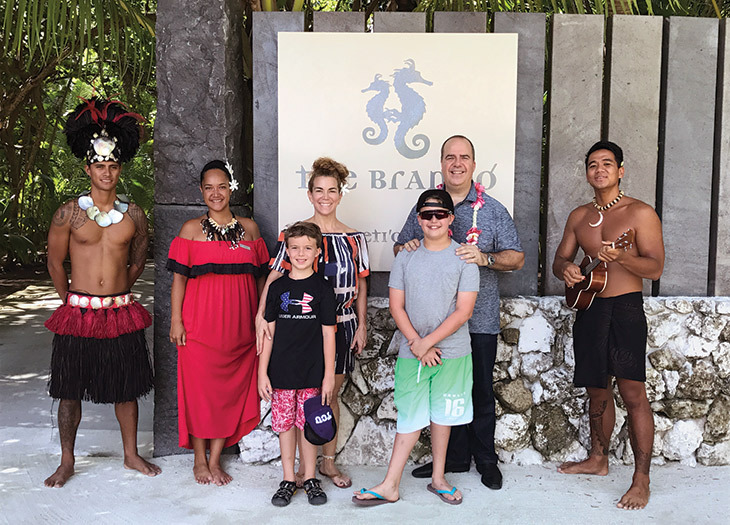 Inspired by that call, Virtuoso CEO Matthew Upchurch and his wife, Jessica, have set out on a journey with their children, Clay and Benji, to celebrate a brighter travel future. “We decided to focus our family vacations around destinations, hotels, and tour companies known for enlightened environmental practices and cultural preservation,” says Matthew. 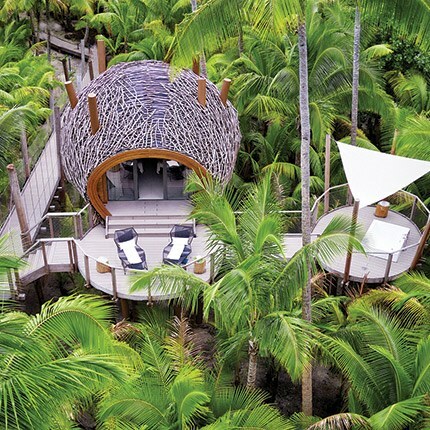 First stop: The Brando in French Polynesia, whose innovative renewable-energy systems and far-reaching plan to protect Tetiaroa atoll – the ancient retreat of Tahitian kings – helped it win Virtuoso’s 2015 Sustainable Tourism Leadership Award. Our director of sustainability, Costas Christ, asked the Upchurches about their travel philosophy – and their experience at The Brando. Why is traveling sustainably so important? eventually lose them. Travel creates paths to human understanding and peace, and allows countries to protect natural resources in a way that wouldn’t be possible without its economic contributions. At Virtuoso, we believe in doing well by doing good. I look forward to the day when all tourism is sustainable. How is The Brando leading the way? Matthew: The late Marlon Brando and owner Richard Bailey conceived the resort to be in complete harmony with nature, from waste management that creates compost for organic gardens to 95 percent renewable energy. Local culture is highly respected, and staff are justifiably proud of their work to restore and protect Tetiaroa. Most impressively, Richard and his team are also happy to share best practices. Jessica: The Brando’s naturalist-led “Ultimate Tour” explores surrounding islands filled with beautiful birds and other wildlife. Our sons spotted blacktip sharks and helped release baby sea turtles as part of the resort’s conservation program. And its “Green Tour” takes you behind the scenes to witness its innovations in action. Jessica: It’s safe, and the friendly staff talk to kids on their level, making them feel special. The villas are also special and very private – everything is designed for maximum comfort, sustainability, and appreciation of the island’s beauty. What do you hope your kids will learn from this experience?